There's a curious and bizarre fact about the universe that is introduced in physics courses without anyone stopping to point out just how curious and bizarre it is. I think it deserves to be more widely known to non-physicists. It's a little esoteric, but not so esoteric it can't be grounded in ordinary everyday concepts. And it isn't something hypothetical but something that is fundamental to modern physics and testable in the lab. It is also the reason why I chose to use theta/2 instead of theta in my quantum computing code. This post will be in two parts. This part will mainly be about geometry and topology, and in the second part I'll talk about the physics. Suppose instead you took a simpler path: you left the bedroom and went to another room and then returned by the path you went. 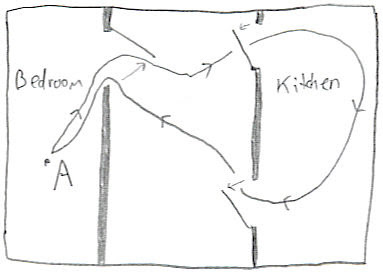 If you had taken a piece of string and tied one end to the bedroom and walked this path playing out the string behind you as you went then when you returned to your bedroom you would have both ends of the string visible. You could then reel in the string from your journey, without letting go of the ends, and see that indeed, both ends were in fact the ends of the same string and so you had retuned to the start of your journey. But if you'd taken the round trip through the double-doored kitchen you wouldn't be able to pull the string tight and so you could no longer be sure. If using a house as an example seems too far-fetched think of a mult-storey car park. It's easy to walk what you think is a closed loop but find that you've in fact walked to almost identical looking, but different, floor. Let's think about this more generally. Given a topological space X we can form another space X' from it by (1) picking a point p in it and (2) forming the set of all pairs (x,n) where x is a point in X and n is a path (up to homotopy) from p to x. X' is known as the universal cover of X. The rule is that we're allowed to twist the belt as much as we like as long as the centre line of the belt is along the axis. Notice how if we rotate the disk through an angle of 2nπ the disk returns to its starting point, but the belt 'remembers' how many twists we took to get there. Notice another thing: if we travel along the belt from one end to the other, the orientation of the belt at each point gives a 2D rotation. In other words, the belt itself represents a path in SO(2) with one one representing a fixed point in SO(2) and the other end matching the current orientation of the disk. So if the orientations of the disk represent elements of SO(2), the possible twistings of the belt represent elements in the universal cover of SO(2). And what the twists do is allow us to differentiate between rotations through θ and rotations through θ+2nπ. In other words, the universal cover is just the real line, but not folded down so that θ is the same as θ+2nπ. With the examples so far, the universal cover of a space has always had an infinite number of copies of the original space. That isn't always the case and now we'll meet an example where the universal cover is a double cover: the real projective plane, RP2. The easiest way to visualise this is to imagine the game of Asteroids played on a circular TV screen. In the usual Asteroids, when you go off one side of the screen you reappear on the opposite side. In this version it's much the same, points on the edge that are diametrically opposite are considered to be the same points. Such a universe is a real projective plane. Let P be the point at the centre of the screen. Suppose we attach one end of our string to P and fly off towards the edge, reappearing on the other side. Eventually we get back to P again. Can we shrink this path down to a point? Unfortunately, any path that crosses the edge of our screen will always cross the edge no matter how much we try to deform it. If we move the point at which it crosses one edge of the screen, the point at the other side always remains diametrically opposite. So given two distinct points in RP2 there are two inequivalent paths between them, and so the universal cover of RP2 is made from two copies of the space and is in fact a double cover. Now we'll try a 3D space - the space of 3D rotations, otherwise known as SO(3). This space is 3-dimensional because it takes 3 numbers to define a rotation, for example we can specify a rotation using a vector whose direction is the axis of rotation and whose length is the angle of rotation. Now all possible rotations are rotations through an angle 0≤θ≤π for some exis. So every rotation can be represented as a point in the ball of radius π. 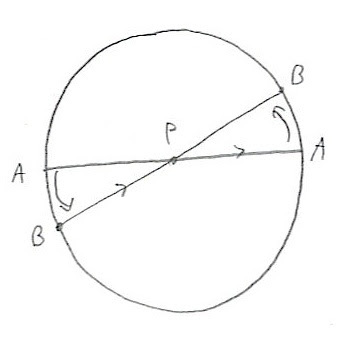 But a rotation around the axis a through an angle of π is also the same as a rotation around the axis -a through π. In other words, SO(3) is the closed 3-dimensional ball with diametrically opposite points identified. This is very similar to the situation with RP2. In fact, almost exactly the same argument shows that the universal cover of SO(3) is the double cover. (For an alternative wording, see this posting.) There is also another way of seeing this that is analogous to the disk with belt example above. This time we have a sphere instead of a disk. The belt is fixed at one end and the other end is attached to the sphere. 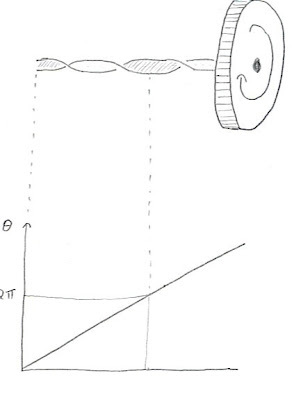 We are free to rotate the sphere however we want, and we're no longer confined to having the belt along one axis. It is an amazing but easily demonstrable fact that if you rotate the sphere through 2π, you cannot untwist the belt, but if you rotate it through 4π you can! This is known as the Dirac Belt Trick, and if you don't believe it, watch the Java applet written by science fiction author Greg Egan. If you've done much computer graphics you'll have already met the double cover of SO(3). Computer graphics people sometimes like to represent rotations using unit quaternions. The unit quaternions form a 3-dimensional sphere but there are two such quaternions for each rotation. So the unit quaternions actually represent this double cover, and SO(3) is a 3-dimensional sphere with antipodean points identified. And that's the geometry dealt with. In the next installment I'll say what this has to do with electrons and my quantum computing code. Balls and Spheres. The closed n-dimensional ball is the set of points (x1,...,xn) such that x12+...+xn2≤1. The (n-1)-dimensional sphere is the set of points (x1,...,xn) such that x12+...+xn2=1. Another way to demonstrate the double cover that you can do in the comfort of your own home is to rotate your hand at the wrist keeping your palm facing upward at all times through 360 and then 720 degree rotation. At 360 degrees your arm certainly will not be in it's original state, but it will at 720. That's the Feyman plate trick which I was lucky enough to see Feynman perform many years ago. How about, for an N-fold cover, take a belt that's N times the circumference of a wheel, and span it out with another wheel, mounted just to help keeping things tight - resulting in something vaguely like a bicycle chain mechanism. Now, for each revolution of the wheel, viz every 2π rotation, you end up at a different point along the belt, but after N of them, you get back to the point you started. Would this capture the structure needed? My quantum mechanics prof demonstrated SU(2) using a belt as well. I thought he was just a little eccentric, I didn't realise it was a trick due to Dirac. There was a talk at Perimeter Institute a while ago by Sundance Bilson-Thompson, who is trying to build a preon model out of braids and ribbons. If his model is true, the electron is described by SU(2) because it is really made of tiny belts! Possibly worth pointing out that the universal cover is actually "universal" in the technical sense that it's initial in some appropriate category, here the category of covers of X and homotopy classes of (surjective?) maps.